Many lawmakers made their names in health care, seeking to usher through historic changes to a broken system. In 2008, as the Republican nominee for president, he ran on a health care platform that dumbfounded many in his party, who worried that it would raise taxes on top of overhauling the U.S. tradition of workplace insurance. 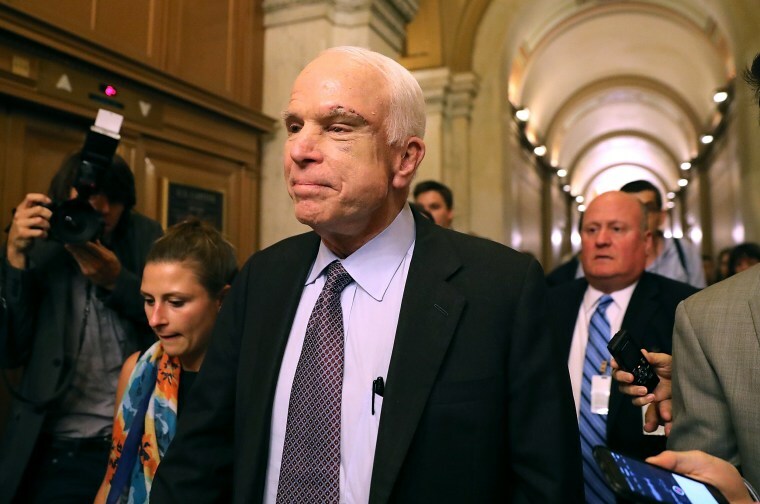 Many will remember McCain as the incidental savior of the Affordable Care Act. His late-night thumbs-down vote halted his party’s most promising effort to overturn a major Democratic achievement — the signature achievement, in fact, of the Democrat who beat him to become president. It was a vote that earned him regular — and biting — admonishments from President Donald Trump. “John’s idea of empathy is saying to you, ‘I’ll punch the bully for you,’ ” he said in an interview before McCain’s death. After Republicans spent months bickering amongst themselves about which was better, McCain was disappointed in the option presented to senators hours before their vote: hobble the ACA and trust that a handful of lawmakers would be able to craft an alternative behind closed doors, despite failing to accomplish that very thing after years of trying. McCain himself had limited use of his arms because of injuries inflicted while he was a prisoner of war in Vietnam, though he was quicker to talk about the troubles of others than his own when advocating policy. The legislation would have granted patients with private insurance the right to emergency and specialist care in addition to the right to seek redress for being wrongly denied care. But President George W. Bush threatened to veto the measure, claiming that it would fuel frivolous lawsuits. The bill failed. McCain’s health care efforts bolstered his reputation as a lawmaker willing to work across the aisle. Sen. Chuck Schumer of New York, now the Senate’s Democratic leader, sought his help on legislation in 2001 to expand access to generic drugs. In 2015, McCain led a bipartisan coalition to pass a law that would strengthen mental health and suicide prevention programs for veterans, one of several veterans’ care measures he undertook. In 2007, trailing other favored Republicans, such as former New York City Mayor Rudy Giuliani, in early polling and fundraising, McCain asked his advisers to craft a health care proposal, said Holtz-Eakin. It was an unusual move for a Republican presidential primary. The result was a remarkable plan that would eliminate the tax break employers get for providing health benefits to workers, known as the employer exclusion, and replace it with refundable tax credits to help people — not just those working in firms that supplied coverage — buy insurance individually. He argued that employer-provided plans were driving up costs, as well as keeping salaries lower.